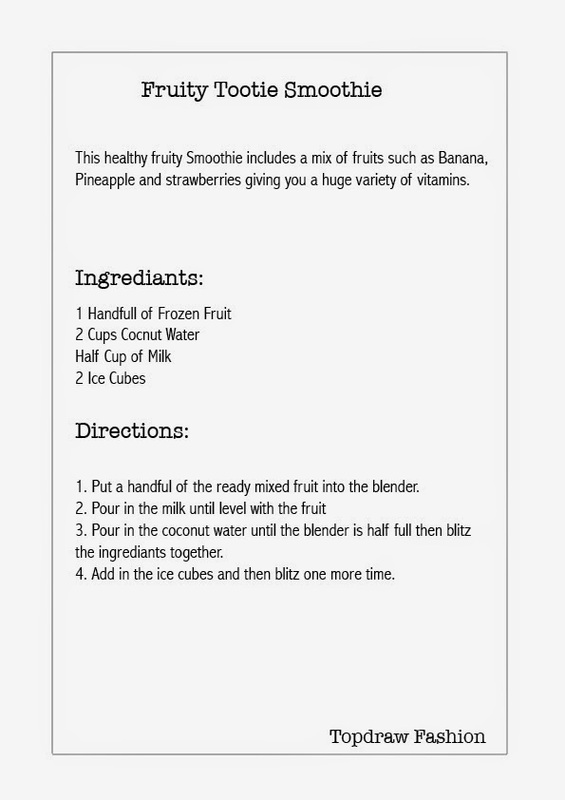 So when I sat down doing some research around healthy smoothies I was thinking about how I could be slightly more productive in the preperation process and making ready made portions so I could just put all the ingredients in the blender and blitz away with out taking the time before hand to cut the fruit up and measure things out. Then my mum was talking to me about these ready made smoothie packs that Tesco have for sale, which are packs of ready chopped frozen fruit. This was perfect and just what I needed so I made a trip to Tesco to get some. I bought three packs as they initially looked quite small and I was not sure how many drinks I would get out of them, which was ideal really as one pack lasted me for three and a half drinks which I thought was great value for money. 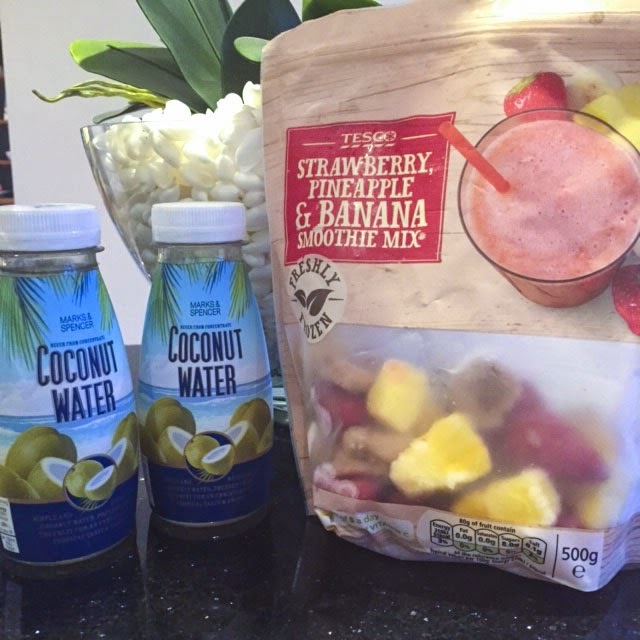 The packs are made up of Strawberries, Banana and Pineapple all of which I love and each have great vitamin properties within themselves. An additional benefit is that the fruit is frozen which is better than Fresh because it freezes all the goodness of the fruit ready for when you want to use them. When making my smoothie it initially was trial an error to see which measurements worked best and to get the right consistency but I got there in the end. 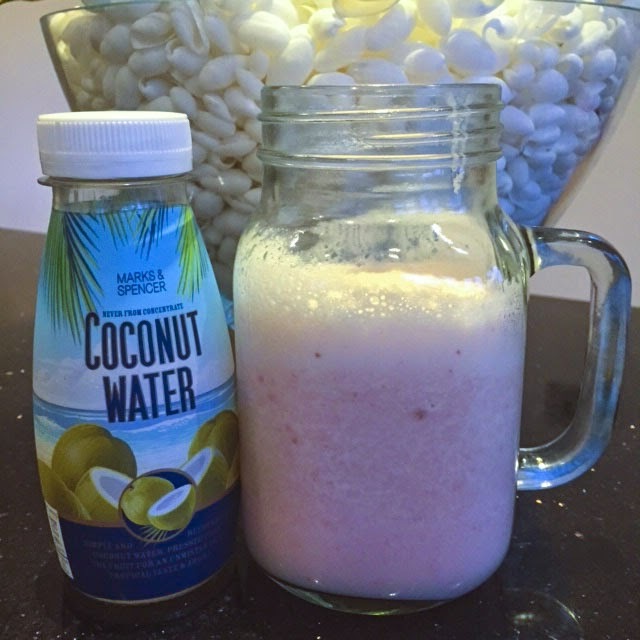 I mixed in milk, coconut water and ice cube which gave it great texture and flavour not to mention the additional nutrients. So without me going on anymore here is how I made my Fruity Tootie! I'm always on the hunt for new smoothie recipes since getting a smoothie maker for Xmas and this one looks seriously tasty - and so refreshing! Will have to give it a go - thanks!